When President Trump blamed "many sides" for the violence at a white nationalist rally in Virginia last summer, Kenneth Frazier decided to speak up. "America's leaders must honor our fundamental values by clearly rejecting expressions of hatred, bigotry and group supremacy," he said. "As CEO of Merck and as a matter of personal conscience, I feel a responsibility to take a stand against intolerance and extremism." It was the corporate version of a mic drop. Frazier, one of the country's most prominent black CEOs, quit one of the president's business advisory councils -- and started an exodus. The entire group fell apart within days. The heads of Campbell Soup, Intel, Johnson & Johnson and Under Armour all made calls to tolerance, morality and virtue on their way out the door. White nationalism, climate change, immigration: On a host of social and moral issues, this was the year corporate America spoke out. Not just because executives believed it was the right thing to do, but because they saw it as a sound business strategy. Often it was a direct response to Trump's policy decisions and public statements. In return, the businesses became targets of some of the president's blistering criticism. 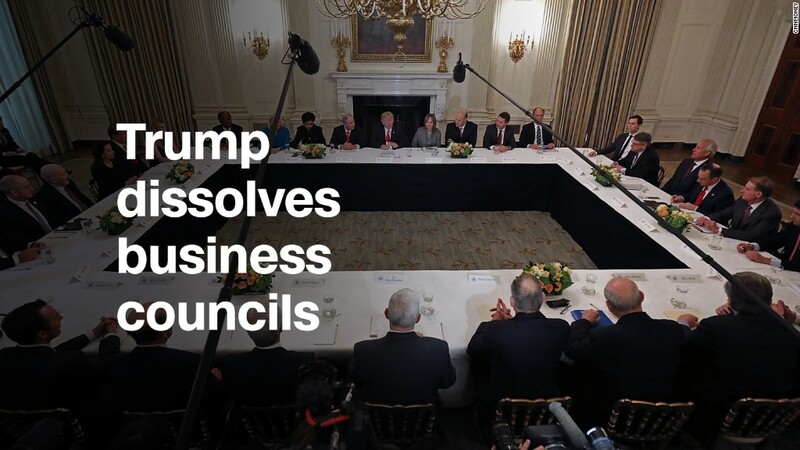 As executives left his advisory council, for example, Trump dismissed them as "grandstanders" and singled Frazier out as "a leader in higher & higher drug prices while at the same time taking jobs out of the U.S."
"This is uncharted territory in terms of political strategies for companies," said Gregory Unruh, an associate professor at George Mason University who studies sustainable business strategy and social innovation. Marc Benioff, CEO of the cloud computing company Salesforce (CRM), spoke candidly this year on issues from climate change and immigration to gender equality. It's not new territory for him: Benioff prominently opposed a controversial religious freedom law in Indiana in 2015 that he said hurt his employees. Opposition from businesses in that state in part drove changes to the legislation. In an interview with CNNMoney this week, Benioff called that event a "seminal moment" for business leaders who may now feel they have "permission" to voice their opinions. "It really reinforced to us that as the CEO of this company, I am looking out not just for my shareholders, but all of my stakeholders," he said, adding that a "modern CEO" has to advocate for employees and customers, too. "Today, it's more important for a company to be clear about what's really important to it than ever before," Benioff said. Many companies that spoke out against administration policy this year cited economic reasons. Dozens of companies -- including Amazon, General Motors and Google -- campaigned to support protections for Dreamers after the Trump administration announced it would end the program that shields undocumented immigrants who moved to the country as children from deportation. Many of those companies mentioned the Dreamers among their own employees. "If Congress fails to act, our economy could lose $215 billion from the national GDP and $24.6 billion in Social Security and Medicare tax contributions," the dozens of companies wrote in an ad published in Politico. "They are part of why we will continue to have a global competitive advantage." Businesses were also at the forefront of the criticism over Trump's decision in June to pull the United States out of the Paris climate agreement. Goldman Sachs (GS) CEO Lloyd Blankfein called it "a setback for the environment and for the U.S.'s leadership position in the world." Tesla CEO Elon Musk outright quit the president's advisory council after the announcement -- one of a few ways he broke with Trump on policy this year. "Climate change is real," Musk tweeted at the time. "Leaving Paris is not good for America or the world." As Unruh pointed out, it also made business sense: Tesla makes electric cars, and one of its subsidiaries specializes in solar energy. In any case, Musk had made up his mind in that moment. But his opposition to Trump's policies was not always absolute. After Musk met with the president at the beginning of the year, he said that his seat at the table would "on balance serve the greater good." He held onto his advisory council position even after he denounced the White House's temporary ban in January on travel from seven Muslim-majority nations. Musk's decision was ridiculed by a startup investor who spent hundreds of thousands of dollars on a campaign that urged him to "dump Trump." Former Uber CEO Travis Kalanick was bombarded with even more aggressive criticism, mostly from generally liberal Silicon Valley, for his relationship with Trump at the beginning of the year. He defended his decision to work with the president at first, but later walked away. Benioff, of Salesforce, served on a technology committee for President George W. Bush and met with Trump earlier this year. He said joining such a committee can put an executive in a tough spot. "When a CEO joins an administration committee, they are really becoming part of the administration. And that's just a very hard thing for any CEO to do. And I just think they did not think this through," he said. "You are never going to agree with everything. You are never going to disagree with everything. But you have to have the ability to have the freedom to disagree." Other companies ventured into social issues without a prod from Trump. And they sometimes found it tricky. In April, Pepsi released what was meant to be a feel-good, come-together ad featuring Kendall Jenner handing a soda can to a police officer on a protest line. The commercial was excoriated online as a clumsy attempt to use protest imagery as a marketing gimmick. And Keurig was panned for its handling of calls to pull its ads from Fox News host Sean Hannity's show. Critics stepped up their campaign against Hannity's advertisers after Hannity failed to condemn Roy Moore, the Alabama Senate candidate accused of sexual misconduct with teenagers. Keurig announced on Twitter that it was pulling the ads. Then Hannity's supporters started a #BoycottKeurig hashtag and in some cases destroyed their own Keurig machines. CEO Bob Gamgort said that using Twitter to make the announcement "gave the appearance of 'taking sides' in an emotionally charged debate that escalated on Twitter and beyond over the weekend, which was not our intent." Keurig may not have meant to take a side, but the trends this year are clear: Companies are getting bolder about when they choose to take a stand. How that stand is received, though, is out of their control.